This is a dialog in Persona 2: Innocent Sin, the first version of two games that were both labeled Persona 2. I have not tried the second, but I have very fond memories of the first as an import Playstation (1) game. The second game is sort of like the literal meaning of a doujinshi (“story with the same people”); it’s an alternate reality in essence. Anyway, that really isn’t important. What’s important is that this game is getting a touch up and re-release for the Playstation Portable, allowing us to take advantage of the above high quality sample image. So let’s get this out of the way. “Nightmare” is a girlish demon. I vaguely recall she’s one of the “demons” in Persona who’s based on Western horror traditions rather than Eastern. (For an example of Eastern, take Nurarihyon, who gets a lot of love in the currently airing Nurarihyon no Mago.) Anyway, it’s a demon with a girl personality. This game features interaction between the teenage heroes (of which 3 of 5 are girls, mind you) and demons. The interactions can go well, or they can flop badly. 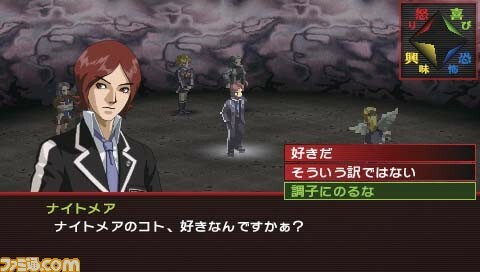 In this case, the main character is speaking with Nightmare. Now, the “kaa” is purely speaking style, so it’s just “ka,” the question particle, plus a gratuitous question mark (common for this kind of dialog). And yes, she’s speaking about herself in the third person. This is a “cute girl thing” and needs to be understood as such. In Japanese, “suki” is a passive verb. It’s asking if the main character has a liking for Nightmare, if he is fond of Nightmare. Indeed, it essentially has the nuance of, is Nightmare his type? That’s not a nuance you will ever get from an official translation. This is for the simple reason that passive constructions are avoided in English whenever possible. Now, don’t think that choosing the polite response is guaranteed to work. Girls aren’t that easy, even video game demon girls. ^^ A positive reply can backfire because Nightmare doesn’t believe you, for example. You can’t control everything here. Wake (訳）essentially occupies a middle ground between a riyuu (理由) and a setsumei (説明), a reason and an explanation, respectively. If there’s a “wake” (wak-eh, strong on the “wak”) for something, there is a basis for it. So, for there to be no “wake” here means that there’s no basis. Or put more colloquially, as these constructions should generally be read, since there’s no basis, that’s not how it is. Put more bluntly than the above phrase, there’s “no way” he likes her. Your choushi (調子) is essentially your rhythm. Idiomatically speaking, it is how you feel, your state of mind, your emotional state… anyway, let’s not get into psycho-babble here. To noru (乗る、のる), or ride, your emotional state is to get carried away (riding on the back of your emotions). So this response would be the verbal equivalent of a slap in the face. Don’t get carried away, demon girl! Well, she’ll either love that or try to rip your head off. This entry was posted in Japanese, Languages and tagged dialog, Innocent Sin, Japanese, language, nihongo, Persona, relationships. Bookmark the permalink.